A day of relaxation, reflection and information on health and wellbeing. Drop-in from 10.30am-4pm to visit an ‘oasis of calm’ in the centre of Broadmead for one of our free workshops, taster sessions and talks, or just to spend five minutes in a quiet space. Throughout the day find out about local projects engaging with physical, social and creative activities in the chapel with free wellness hand scans from My Healing Space and information stalls from Life Cycle UK‘s BikeMinded, LinkAge Bristol, Avon Wildlife Trust and the Bristol and South Gloucestershire Methodist Circuit. 1pm-3pm: Freedom in Movement – Give Alexander Technique a try in the chapel with Bristol Alexander School. 10.30am-11.30am: Calling ladies size 16 or more – join Curvy Girl Yoga with Devaki for a taster session. 12midday – 1pm: Immerse yourself in a relaxing sound-bath with Bards of Avalon. 1.30pm – 2.30pm: Anna from GoodnessMe Nutrition will be talking about improving gut health. 3pm – 4pm: Cookery Demo from JumpStart Food & Fitness – learn to make simple nutritious meals. The New Room is open to all. All events are free and drop-in. To book onto specific sessions and for more info click here. 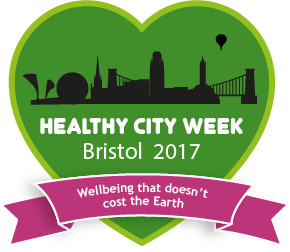 This event is part of Healthy City Week 2017 (7-14 October) – an annual programme of activities exploring wellbeing that doesn’t cost the earth. 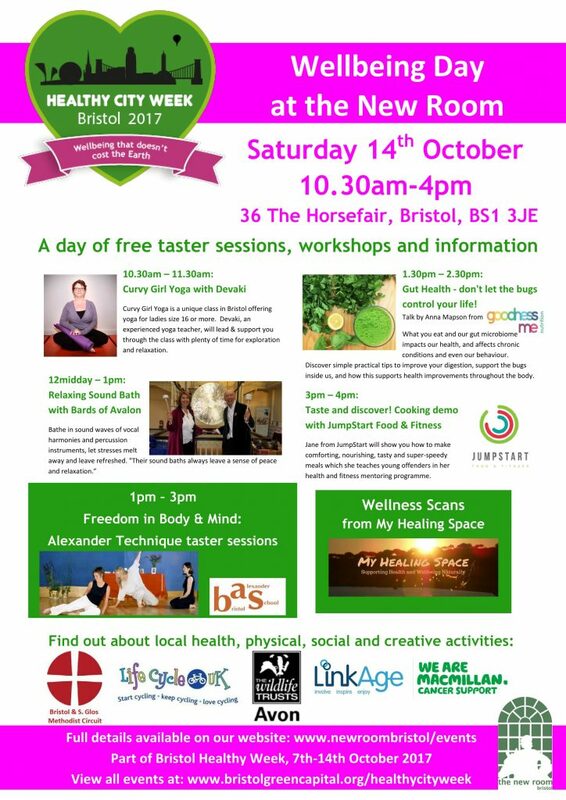 Healthy City Week is formed by its contributors, delivered by Bristol Green Capital Partnership and supported by Bristol Health Partners.